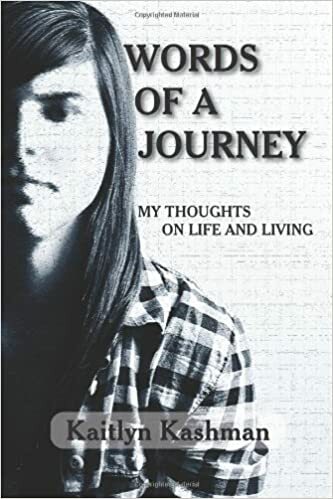 Words of a Journey: My Thoughts on Life and Living is a book written for teens by a teenager. Here Kaitlyn Kashman shares her feelings and insights with other teens in the form of poems and also one- or two-sentence observations. The book has a purpose beyond sharing these thoughts, however, and that is to inspire other teens to write, as well. In fact readers can write their own poems and thoughts directly in the book. Half of the pages are blank and lined for writing, with one of Kaitlyn's poems or thoughts facing the page. Many pages of Words of a Journey contain only one or two sentences written by Kashman, for example, “Expression and emotion are not the same. We hide our true emotion behind a fake expression.” Before turning to the next poem readers can jot down their own feelings or experiences on the opposite lined page. Kashman's writing addresses topics that will be universally relevant to teens. Family, friends, secrets, lies, dreams and, of course, love and heartbreak, are among the subjects Kashman tackles. She approaches these topics with passion and conviction. Her emotions are sometimes raw and in the moment, as if she wrote the lines as she was experiencing the feelings. Readers will sense that Kashman has used writing as a tool for processing her own emotions and may be inspired to write, not only in response to the prompts in this book, but at times when their own emotions feel powerful enough to overwhelm them. At other times Kashman's writing is serene and philosophical, as though she is reflecting on those emotional moments and the lessons she has learned from them. Kashman chooses a few words or lines to capture each idea in a way that is not too specific to her own life. Teens are encouraged to relate Kashman's observations to their own experiences, and then, to write about the topics in a way that is meaningful to them. Some of Kashman's ideas may inspire teens to think in a new way or help them put words to feelings for the first time. Readers may also gain the confidence to write themselves simply from seeing Kashman's example. Here is someone their own age who has explored her feelings in writing and gathered those thoughts in a single volume. It is easy to imagine, while reading Words of a Journey that the process was both comforting and empowering for Kashman. Young readers will surely benefit from following Kashman's example, and the format of the book makes that particularly easy. Quill says: Words of a Journey will inspire teens to write through its example.